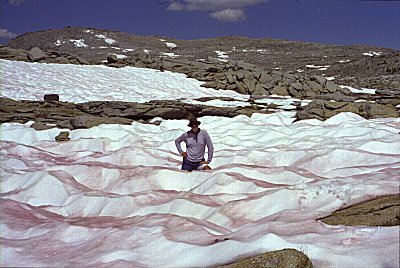 The winter and spring of 1998 were seasons of heavy snowfall and late thaw. 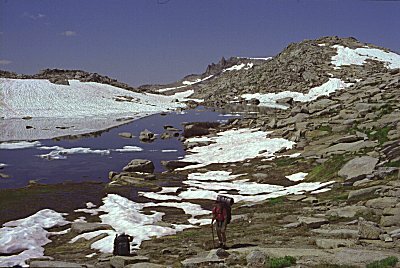 The result was that, in late July, Moose and Pear Lakes were entirely frozen, and the high passes like Elizabeth Pass were closed. 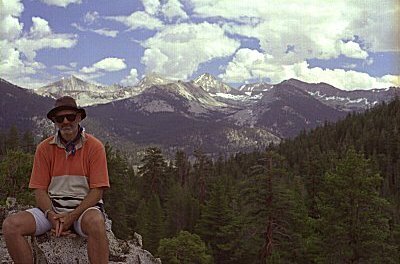 I might have moved the date of my Sierra hike to late August or even September, to avoid the snow, but I had to be back by late August to see my daughter to her freshman year in college. So I planned a conservative schedule with a lot of bail-out options, and hoped for the best. 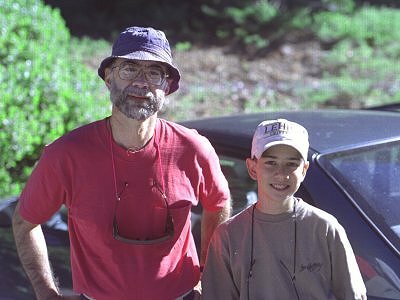 On this trip I was accompanied by Roy and his son Michael. 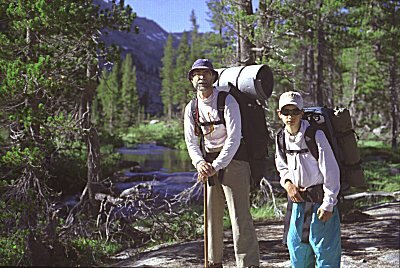 Roy has hiked with me other years, with his daughter Eva. Now it was Michael's turn. We flew in to Fresno, arriving late due to flight delays. Some of our baggage did not arrive until a later flight, delaying us further. 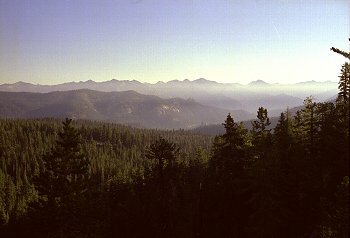 It was about 110 degrees in Fresno, and we could not wait to get up into the mountains. 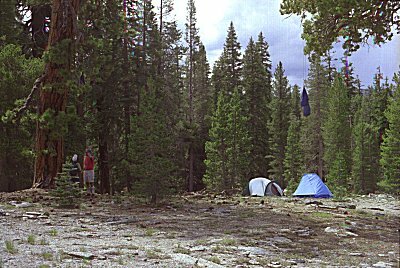 All the campgrounds where I usually stay were full, so we went back to the Forest Service land and camped a ways off the road near Big Meadow. I tried sleeping out, but finally had to set up the tent because of the mosquitoes. Still on Eastern time, we got up at 5:00 AM and packed up, determined to be first in line at the backcountry office. We were almost the first, but I found out that the day's permits had mostly been given out the day before. I with they had told me this before ! At least we got something, even if it was not our first or second choice. Our party of three almost exhausted the quota of fifteen. The trail to Alta Meadow was familiar to start with -- the Pear Lake trail I have been over many, many times. I must have been carrying an unusually heavy pack, because I seemed to be going a lot slower than usual. Roy and Michael politely waited for me to catch up. 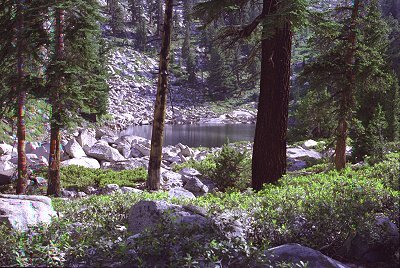 When we got to the turn off to Pear Lake, we were briefly tempted to just go that way, knowing that it would be extremely unlikely for the ranger to check our permit. 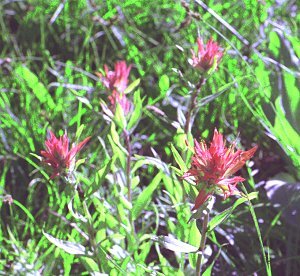 But we are all too law-abiding for that, and we dutifully turned toward Alta Meadow. 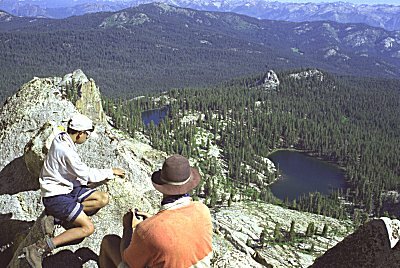 It is exhilarating when the trail reaches Panther Gap, emerging from closed-in forest to the great views across the Kaweah River valley. We stopped for a wile admiring this vista, then went on to Mehrton Meadow where we had lunch. 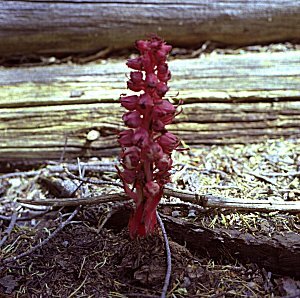 The rest of the way to Alta Meadow was hot, dry, and increasingly difficult due to our heavy packs, our acclimatization, our time-zone change, and our body's sudden shock at being asked to do so much. We were all sore and ready to stop when we reached the meadow. A couple hours lounging around camp cured some of that. 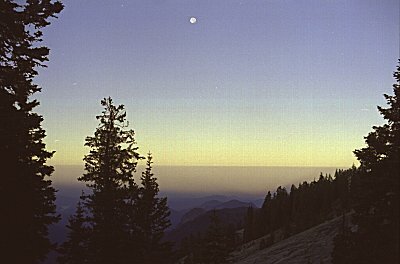 By now I was glad we were at Alta Meadow rather than anywhere else: it was cool, free of insects, with great views of the canyon, the sunset, and the night sky. 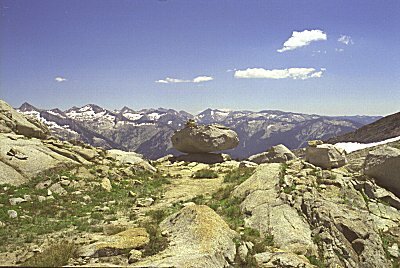 The formal trail ends at Alta Meadow. 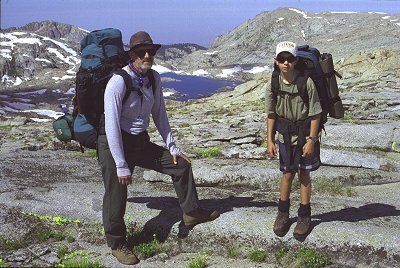 We were headed for Moose Lake on an "indistinct" marked route. I had been this way once before, in the other direction, and I had a vague recollection of the route. Actually what I remember best was how difficult it was to follow, and how I constantly got into tough spots when I would get off the route. I was surprised, given the number of permits issued for this trailhead, that we had seen only one party all day, and that was going the other way. No one was in sight at Alta Meadow, and no one passed us (that we saw). Where were all the people ? Maybe they went to Pear Lake. We passed one tent early in the morning, at the far end of Alta Meadow, but that would be the last sign of people we would see for a couple days. The trail was indistinct, but we had no real trouble following it. Someone had put of lots of piles of rocks, and they actually made a pretty good route to Moose Lake. We started running into patches of snow, but infrequent and easily avoided. So we were surprised when we arrived at Moose Lake to find it half frozen. 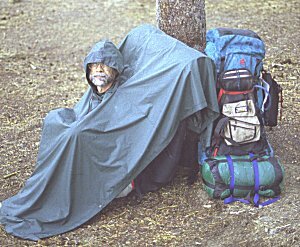 We had lunch by the south rim of the lake, and I set up my poncho to make a little shade so that I could take a nap. 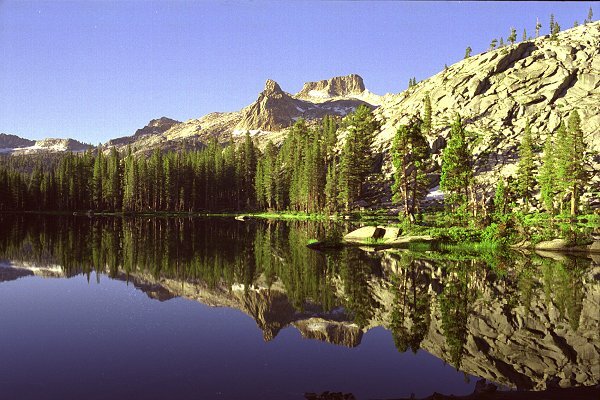 After this refreshing interlude, we proceeded around the lake to a nice campsite. The day before we started hiking, we could see that the higher elevations were shrouded in clouds -- it looked like it might be raining. But since then the skies were perfectly clear. It looked like we might have great weather after all. We all decided to skip the tents and admire the sky. We saw 13 satellites: bright ones, dim ones, disappearing and reappearing ones; going in all directions of the compass. It helped to have three of us looking: I have never seen even half this many satellites in one night. We saw a few shooting stars too, a couple of which streaked across the whole sky and left trails of twinkling "stardust". The shooting stars were all coming out of the North going roughly South. Finally we were getting used to the packs, to travelling by foot, and to sleeping on the ground. My compulsion to get up and get going early was finally waning, and we all slept in late and got an unhurried start. We headed up the ridge north of Moose Lake, getting a better view of that magnificent lake. We could have continued along the ridge, as I have done several times before. But there were a few steep spots on it that we decided it would be better to avoid, so we crossed down into the Buck Creek Basin and back up to the ridge farther on. 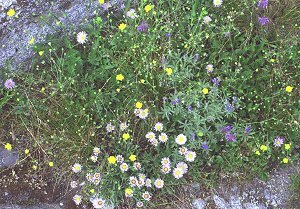 We were getting more and more confident crossing snow fields, and we seemed to find lakes and small meadows around each corner. We wandered among these lakes, looking down at Table Meadows and remembering the trip, years before, when Roy and I had been there with Eva and Carrie. Curiously enough, we passed a few hundred yards from a solo hiker high in the tablelands. We passed quietly, without acknowledging each other's presence. It would be the last people we would see for days. 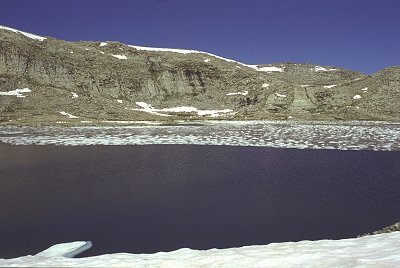 We continued until a bit after lunch, and then set up camp in a little notch between two snow fields a couple hundred yards from a lake. It was threatening rain, so we quickly set up tents and got inside, but the shower lasted only a minute or two. The rest of the afternoon alternated between clouds and bright sun. After taking a nap, I hiked on up to the head of Ferguson Canyon, happy to find out we were just where I planned. 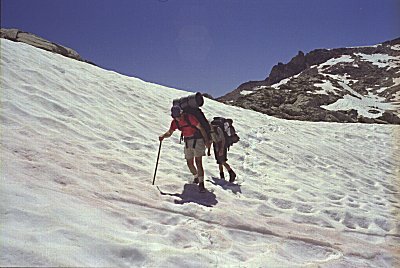 The descent into Ferguson Canyon was worrying me: would we be able to find a way down despite the snow? 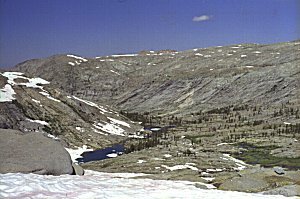 I quickly saw that the route I had used to climb out of Ferguson Canyon years ago was completely snow covered and out of the question. The route to the west though ... maybe it was passable. I studied it through my binoculars, foot by foot. 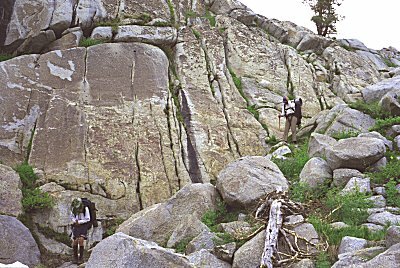 If we could get onto the west ridge, I thought we could make it over to a boulder field and then down. At least I hoped so. I took comfort in the thought that we would be able to stay clear of steep snow, and that we had plenty of time to explore somewhere else if we could not make it into Ferguson Canyon. Again we got a lazy start to the day, in part because everything was damp and took a while to dry out. It was definitely more humid than usual. We headed up toward the crest, longing to peek over the side. I had already done so the day before, and just wanted to head directly toward the west ridge. 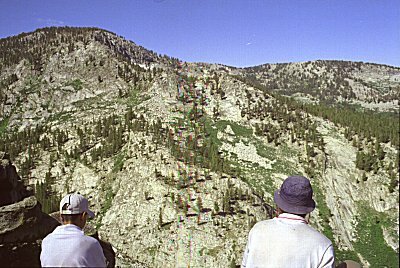 But the vistas of Ferguson Canyon seemed to have a inexorable pull on Michael, and he kept going farther and farther right. After losing sight of each other for a few minutes, we resolved to do better at staying together. 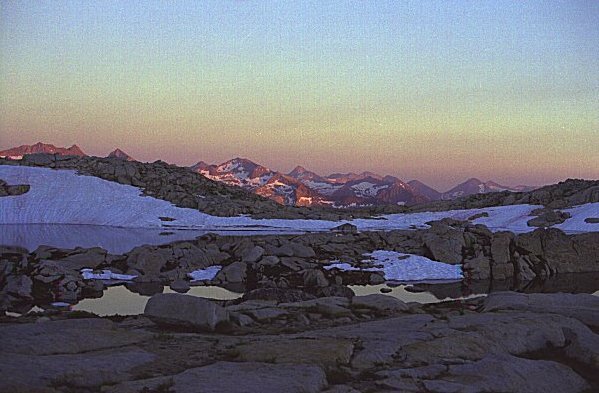 The distance to the west ridge was greater than it had seemed, with more ups and downs and more snow crossings than had been apparent in the binoculars. Now I remember, this is how it always is. We edged closer and closer to the ridge. We managed to avoid the part that looked hardest in the binoculars, because we did not actually go up to the ridge, but stayed slightly below it. So this part was an anticlimax. On the other hand, we were under increasingly ferocious attack by mosquitoes. As we were moving, we could swat them off our shoulders and face if we kept our attention on it. But stop moving, and hundreds would land on my shoulders, my hat, my pack, my face. We would have liked to rest, or at least to have admired the scenery, but we had to keep moving. 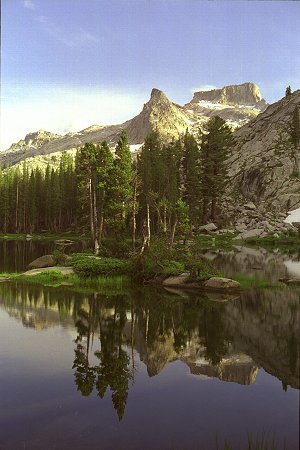 We descended the steep cliffs, winding our way down cracks and into the stubby little trees just at the tree line. 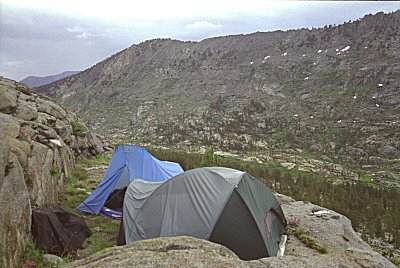 While we were still high on the steep west wall of the canyon, it began to rain and the mosquitoes seemed to intensify. We began a mad search for someplace -- anyplace -- to set up our tents. We picked a nice flat ledge about six feet wide, with cliffs above and below but with water only a hundred feet distant. We just got the tents up in time for the heavy showers. The morning brought clear skies for a while. Each day, we had noticed more and more clouds, forming earlier in the day. But at least this day started clear. Due to our position on the mountain, we caught the sun very early, dried out, and were on our way pretty quickly. 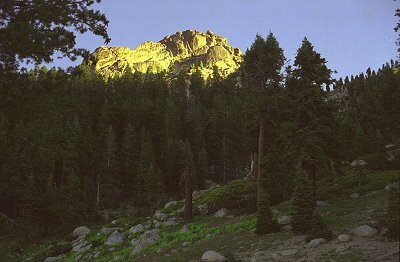 As we continued to descend, we dropped back into the morning shadows, where the sun had not yet made it above the ridge. As we came to the grassy canyon floor, we saw tracks in the dew ! Ferguson Canyon is one of the places I would least expect to see anyone. Clearly someone or something had passed this way, but what ? We followed them for a couple miles, but never once saw a boot print (or a hoof print for that matter. It had to have been a person -- it followed a relatively straight path alongside the edge of the meadows. But was it going up or down the canyon ? We never figure it out. Eventually the sun came up in the canyon floor, the dew evaporated, and we lost the trail. 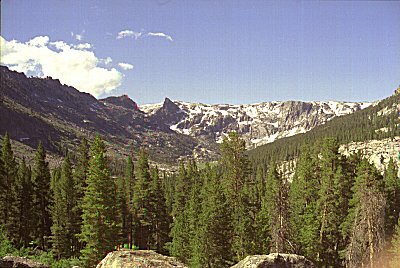 Our objective was to climb to the gap west of Scenic Meadow. We had to remove our shoes and wade across Ferguson Creek, and then climb up a steep rock fall to the gap. I did not remember it as being this tiring, but I was going down last time. We made it to the gap by lunch time. We had been chased incessantly by mosquitoes the whole time we were in Ferguson Canyon, lessening our enjoyment of it considerably. We were beat, having stopped to rest almost not at all. The gap was sunny, warmer, and free of mosquitoes. What a relief. Good riddance to Ferguson Creek. 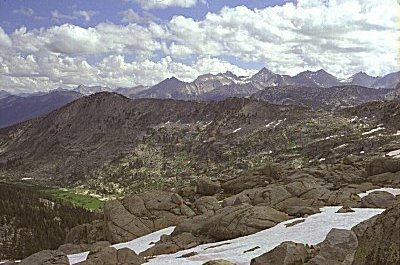 We had planned to stay in Scenic Meadow and to descend into Deadman Canyon the next day. Now our instincts told us to stay out of meadows ! So we stuck to the ridge, more or less. We traversed to the next gap, then decided to climb Barton Peak. We were so close, why not ? It was a bit much for Michael, who was running out of steam, but we were rewarded with great views and no insects. 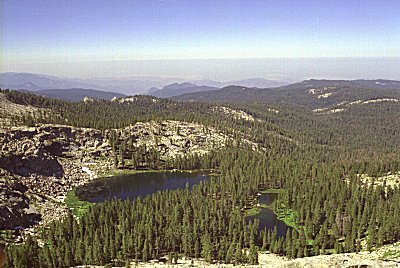 We spied the lake at the foot of Barton Peak, and decided to make that our day's destination. The descent from the peak was very steep, but mostly over rocks thinly covered with soil -- much easier than descending rock falls. We had to search and search for a flat place to sleep -- there was almost no level ground anywhere in sight. This had been our longest day of hiking, and we were all very tired. It was almost more than we could do to make our way to the lake and dabble our toes in the water. This was supposed to be the best day for meteor viewing, but we were camped among trees that obscured our vision, and we were all too tired to stay up anyway. So we skipped the sky watching and went right to bed. Everyone work up refreshed and ready to go. It helped that our route would be downhill all day. I didn't have a really definite plan for where we would go, but I wanted to get to the Sugarloaf Creek trail in a day or two. I thought we could descend the steep slopes immediately below the lake (which I had briefly explored the day before, and could see were safe to descend), then see what the flatter areas below looked like. I thought we might try to come out near Scaffold Meadows, or perhaps we could curve over more toward Ferguson Creek. 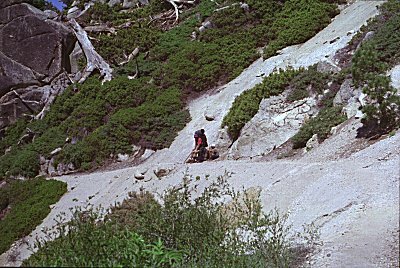 When we got down the steepest slopes, it seemed prudent to try to keep to the less-steep portions of the hillside, rather than plunging right down into Deadman Canyon. We continued to walk through charming, tree-shaded glens with occasional meadows. 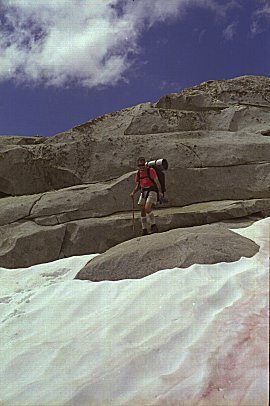 The ground was dry here -- the melting snow was at much higher elevations -- so that we were relatively free of pesky insects. We came to a beautiful overlook before lunchtime, but it just seemed like a good place to stop and eat. After lunch, it seemed like too good a place to leave, and we decided to call it a (very short) day. While we were on the peak, clouds rolled in, followed by thunder and then rain. 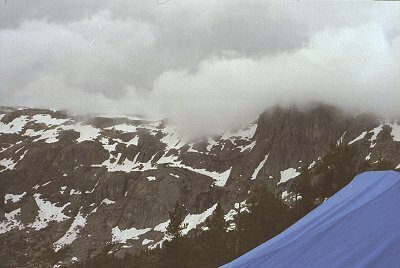 We made a hasty retreat from the peak, into our tents. It didn't last long, however, and before evening I had taken my tent down, determined to be able to admire the sky at night. Well, the mosquitoes came out at dusk, and so I had to put my tent back up. Then about 2:00 AM I work up to the sound of rain, so I was up again to put on the fly. I was so proud of myself, locating the fly (hanging from a nearby tree), attaching it, and staking it, all without turning on the flashlight even once. 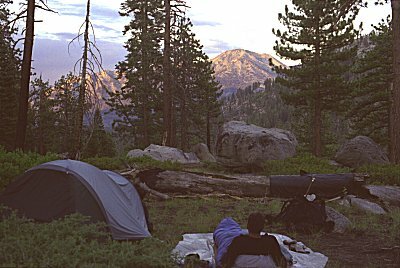 I got back into the tent, just at the rain was tapering off, never to return that night. Then I had to turn on my flashlight to exterminate the 20 mosquitoes that had smuggled in with me. We left our beautiful perch early, looking forward to rejoining the trail this day. We started by crossing several meadows, picking up scores of mosquitoes. Going became more and more difficult because of the large number of down trees. Fallen trees are so much more annoying than big rocks in my book -- partly because they seem to go on and on for miles at a time. The trail got steeper, but was still clogged with brush and trees, then when it looked like it might be easier, the slopes turned out be covered not with grass but waist-high thorn bushes -- completely impassible. So we struggled along through the brush beside the creek. What a relief it was to come to the trail. It was a shock -- none of us suspected we were near until we stepped onto it. 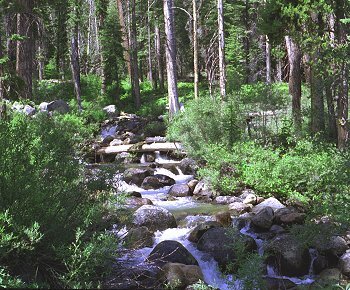 As soon as we joined the trail, we had to cross Ferguson Creek. We decided to stop and have lunch. We did not see any good place to cross, so we took off our boots and waded across, making several trips to ferry everything across. As we were relaxing on the other side, a group of hikers (the first we had seen in days) zoomed past, going downstream a few yards to a log, and disappeared within seconds. Oh well, we were having fun anyway. From here, we continued to see hikers along the trail in greater and lesser numbers all day long. 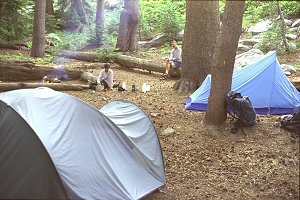 As we approached the crossing of Sugarloaf Creek the rains started, and we were at a decent camp spot, but we stubbornly refused to give up and make camp. Instead we put on our ponchos, and huddled under the trees as lightning struck all around us. Half an hour later it looked like the rain was letting up, so we took off our boots and waded across Sugarloaf Creek. We hiked on in the light rain, listening to the rumble of thunder for hours and hours. We were looking for a good place to stop and camp by the stream, but those with more sense had stopped when the rain began, and were occupying all the good spots. 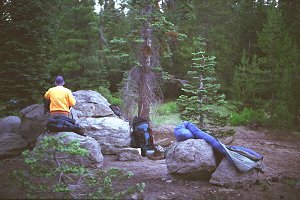 Finally, as the trail started to steepen markedly, we located a great campsite a couple hundred yards above the trail, on a rocky outcrop. No one could see us, and we had a nice level campsite all to ourselves. But it was a twenty minute roundtrip to the water. And the area had recently burned over, so that everything we touched rubbed black stuff onto us. We had set out our damp clothing at night to dry out, but it didn't seem to be any drier in the morning. So I gave up and packed up everything wet. Roy and Michael tried to dry out a little longer, but eventually they gave up too and we got going. 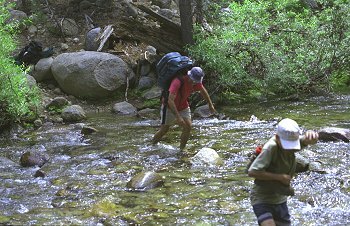 We met with a group going our way, who revealed that their gear had been carried by pack stock. We had managed to keep this possibility a secret from Michael up to mow, and he didn't say anything, but the look on his face was one of disbelief. Why didn't we do that ??? The trail rose steeply, and then less steeply, through beautiful country. Some places had no mosquitoes, and some places had swarms, but we kept on going. Something about the trail was making us want to go, go, go. The miles passed quickly, and we neared Ranger Lake at lunch time. We had planned to take a break there, and to make up our plan for the afternoon later. Just as we arrived, our plan was made for us as the rain started. We found no one else at the lake, so we picked the best site, set up tents, and dived in. I napped most of the afternoon, but I awoke from time to time to head a vary large and noisy crowd of people very nearby. By the time I got up and looked outside, they had all departed. There was one other party camping at the lake that night. We were camped near a fire ring, amidst generous supplies of firewood. Michael had been longing for a campfire the whole trip, and this was his chance ! I personally do not enjoy campfires: they get my pots dirty, the smoke smell up my clothing, and it takes too much work to keep them going. 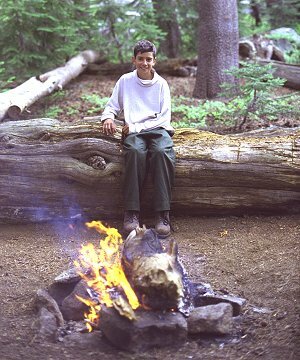 However, I can remember when I was Michael's age, when the campfire was (by far) the best part of the camping trip. I can remember how much fun it was to gather, chop,arrange, and light the wood, tend (play with) the fire, cook with it, and put it out. So ... we had a fire. Michael did all the work, and I stayed far enough away that I did not get all smoky. The warmth was pleasant, and allowed us to stay up well past dark talking instead of heading right for the warmth of our sleeping bags. The day again started out clear and beautiful. I again gave up trying to get my gear dry, and simply packed it up. 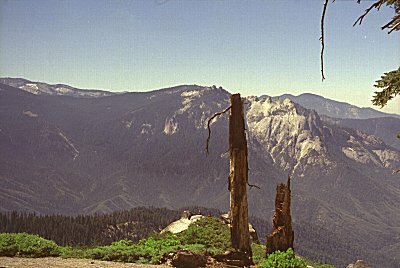 The trail rose steeply toward Silliman Pass, to increasingly widening views of Sugarloaf Valley. Our packs were lighter than a week before, and we were in better shape, so that we arrived at the pass unexpectedly quickly and feeling pretty good. We made a short side trip to the Twin Peaks just off the pass. We climbed as far as we could up the northern peak, and were rewarded with a view of the lakes and forests we had just hiked through for the past couple days. 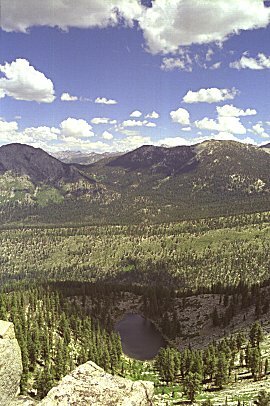 Then we climbed the southern peak and looked out over Twin Lakes and the area we were heading for. 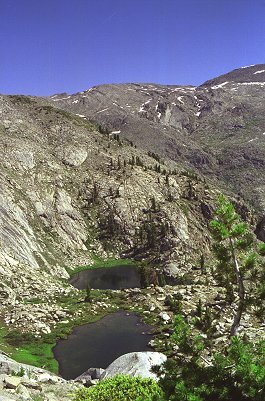 Next we descended to Twin Lakes. We had planned to stay at the lakes the final night, but after having lunch we decided to return to Lodgepole a day early. The lakes were beautiful, and there was only one party camped in the vicinity, but I was already starting to think about getting home, about reentering the hectic old "real" world again. We passed dozens of people (including a big bunch of scouts) headed for Twin Lakes, so it was probably just as well that we left. We covered the miles from Twin Lakes quickly and almost without stopping, arriving at Lodgepole thoroughly tired. We could see clouds up in the higher elevations, but down here it was clear and hot. The ranger assured us that it had been hot and dry all week -- no rain. 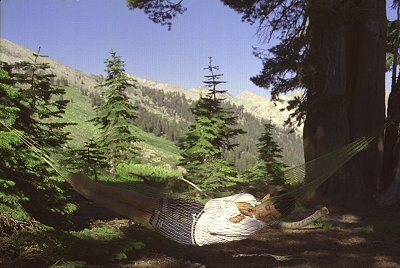 The heavy and late snow meant that early August was springtime in the higher elevations, accounting for the mosquitoes. 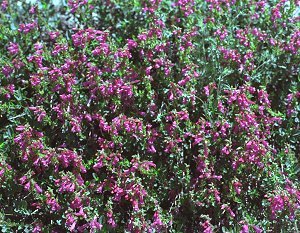 On the other hand, it also meant abundant wildflowers. Here are a few of the wonderful flowers we observed.